MEDPL 283 News Video Reporting students enjoyed a behind-the-scenes tour at News12 in the Bronx on Sept. 17, thanks to multimedia reporter Emily Lorsch. 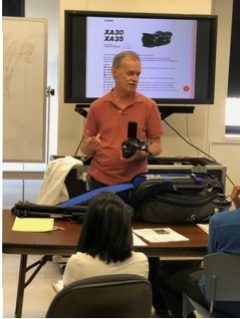 Lorsch, who studied journalism with Prof. Sissel McCarthy at Emory University, guided students through the newsroom, introducing them to producers, reporters, editors and the assignment desk. 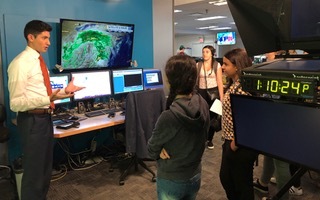 She also gave students a crash course on how to read and operate a teleprompter at the same time, while News12 meterologist Mike Rizzo, a.k.a Meteor Mike (in photo, standing on left), showed them how to use a green screen like a pro. News 12 Networks is the largest 24-hour local television network in the country with news, traffic and weather channels serving the Bronx, Brooklyn, Long Island, New Jersey, Connecticut, Westchester and Hudson Valley.